FlightSafety International MissionFit training system. 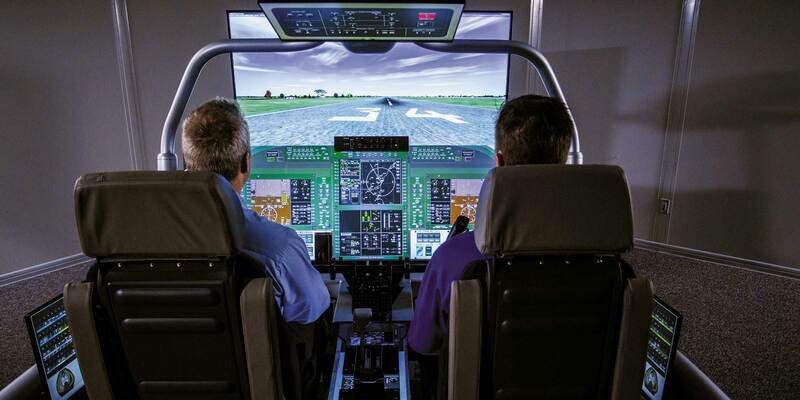 The two dominant business aviation training providers, FlightSafety International (Booth A239) and CAE (Booth B417), both express “cautious optimism” in the Asia-Pacific market, but have no near-term plans to deploy additional full-flight simulators (FFSs) in the region. Nick Leontidis, CAE group president of civil aviation training solutions, said, “Signs of improvement are evident in business aviation, even though new jet deliveries have remained flat since 2012.” He views last year’s spike, “between 3-5 percent,” and new models preparing to enter the market (Dassault Falcon 6X, Gulfstream 500/600, Bombardier Global 7500) as encouraging. CAE has one FFS in the region, also a G450/550, at the Shanghai Eastern Flight Training Center in the Waigaoqiao Free Trade Zone. FlightSafety has placed emphasis recently on a couple of relatively inexpensive flight training devices. They are developing a business aviation version of a mixed-reality (MR) training system, leveraging a test program for the T38C Euro-NATO Joint Jet Pilot Training Program at Sheppard AFB, Texas. Using a commercial-off-the-shelf headset and the company’s high-end VITAL 1100 visual system, the MR system allows a pilot to see and interact with a virtual cockpit, as well as checklists and notes. It can incorporate flight controls for fixed-wing or rotary-wing aircraft. “When they're interacting with the panel, they can see their hands; they can see what they're doing,” Gross explained. The company’s Simulation Innovation Lab in Tulsa, Oklahoma, unveiled in December a new glass-and-graphics technology branded as MissionFit. A single piece of “smart glass”—with built-in projection, wireless connectivity, and touch-screen—is used to display an aircraft’s avionics panel. The glass can also accommodate tactile components such as a flight guidance panel, gear handles, and throttles, and customers can add a separate out-the-window visual system with a large-screen television or a projection technology. FlightSafety’s Gross noted that many of the company’s Asian customers travel to the U.S. for training. “That’s why we offer the Gulfstream G650 in Long Beach.” FSI features simulators for several Gulfstream models at its southern California location, as well as three Textron Aviation types. FlightSafety and Textron’s TRU Simulation + Training recently announced their intent to form a joint venture to combine their simulators, courseware, and staff to address training for Textron’s business and general aviation aircraft.